How can i change the font colour in a form. a custom class doesn’t work. The colour still grey. Thanks. The class has to be applied to all the fields in the form. You can’t just use a class for the whole form. Click on a individual field and then apply a class to that field. @Eldar at the Bloc Master website has some great core training for blocs. It’s really worth the money, and all of the elements used in blocs have individual videos. The core training is organized really well and serves as a great reference for not only learning Blocs but reviewing how to use core elements. Hi Casey1823, thanks for response. I did it. Every field has a class. But I can change the colours for the typing text but not for the placeholder text. Placeholder text uses the same text you use when you to fill out the form. You can create a class for user input text and this will change the placeholder text. You just can change them individual. sorry, that doesn’t work. the placeholder text should be white. the placeholder text still grey. See the image. What is wrong? Maybe you can’t? You can control the text a user inputs using a class but it does not change the placeholder text. You can use the class “.form-control” to set the color of the input fields. I hope that was what you were looking for. I am away from my computer, so I can’t find the solution myself, but I don’t think class .form-control will solve the issue. As I understand, the problem is with the color of placeholder text. I think .form-control will change the color of the input text, but not the placeholder text. Ok now I get it. To control the color of the “actual” placeholder text. 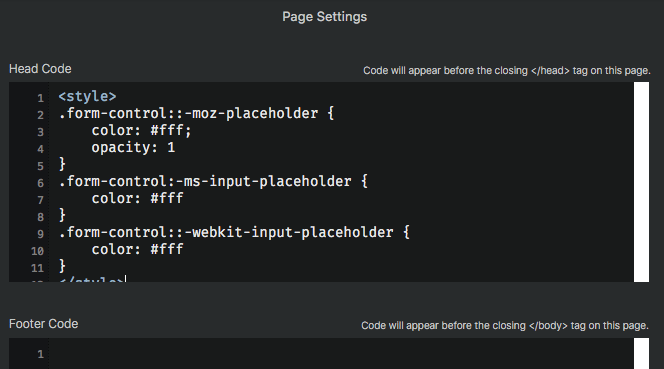 into the “Page Settings > Add Code > Head Code” and edit the color value to your liking. Interesting! 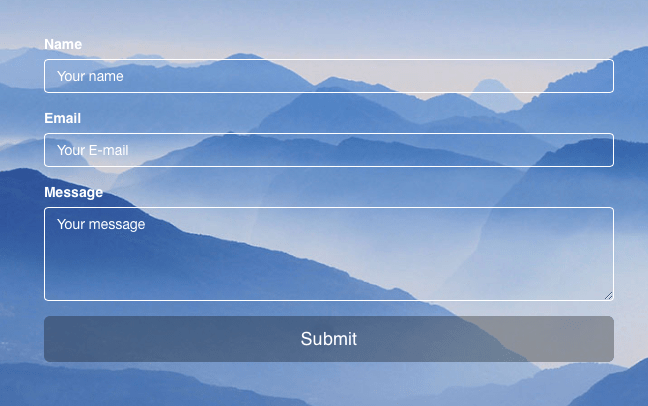 Does Blocs strip out the :: marks if you try to add these classes via the class manager? Ok I’ll stop that in the next beta.